The one thing I've been noticing lately is how easy I can turn everyday moments with my kids into educational experiences. Part of me thinks it's because, as I watch my kids grow up, I want to have as much of an influence on them while they still want to listen to me. The other part of me thinks that after 7 years, I'm finally getting the hang of motherhood! Whatever it is, I know that we're growing and learning together, and as hectic as things get sometimes, it is something to treasure. Last week on the Kid's Co-op, there were so many cool science posts that caught my eye. Here are 5 that I think you may like too. Learn About Raising Tadpoles with Taming the Goblin. My son did this in science class, and seeing the images from Taming the Goblin's blog post makes me want to try it at home. Doesn't this bubble science from Buggy and Buddy look like fun? 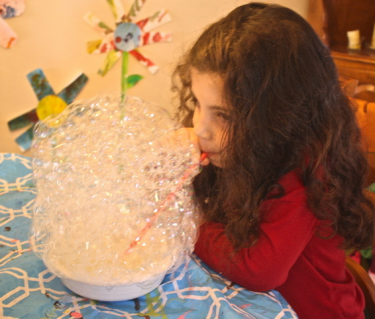 We don't officially have a 'Summer Bucket List' in our house, but everytime I see big bubbles, it's a reminder to buy glycerine sometime soon so that we can experiment with bubbles. Over the past month, my kids and I have been experimenting in the garden. If you're short on space or don't have the time to grow a garden this summer, you can learn how easy it is to grow onions at home with Tercets. I have to admit, I'm a failure when it comes to making homemade gak. I only tried to make it once, and it was not gak-ish at all! 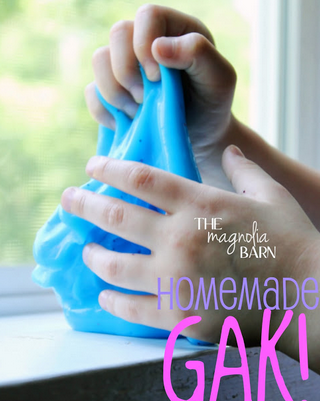 This summer, I am definitely going to try and make gak using this tutorial from The Magnolia Barn. Find out about the Back to The Roots Mushroom Kit with Gift of Curiosity. I'm a huge fan of Back to the Roots and we had lots of fun with our at home mushroom kit last winter. Not only is this a really cool gift for kids, but the company works hard to reduce, reuse and recycle every chance they get.